Published: Jan. 2, 2014 at 03:16 p.m. 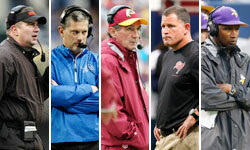 Updated: Jan. 2, 2014 at 04:39 p.m.
We pointed out last week that San Diego Chargers offensive coordinator Ken Whisenhunt would be a prime candidate to take over in Detroit if the Lions ousted Jim Schwartz. Now we know that is indeed the case. Citing people who have received calls from the Lions, NFL Media Insider Ian Rapoport reports the organization has been calling around, checking Whisenhunt's references. Detroit's interest is "very strong," per Rapoport. Whisenhunt cannot be interviewed until the Chargers are eliminated from the playoffs. Having steered the Cardinals to the first Super Bowl appearance in franchise history, he's an obvious candidate to attempt the same feat with the Lions. His tutelage of Ben Roethlisberger and Kurt Warner has to be appealing to a front office that has a raw but exceptionally talented Matthew Stafford locked up through the 2017 season. Rapoport later reported the Lions will interview Ravens offensive coordinator Jim Caldwell on Friday, per a source close to the coach. Although the team has also done background work on Seahawks assistant head coach/offensive line Tom Cable, an official interview request has not been forthcoming.